Here are the best Puerto Rico hotels and resorts, located in the most popular and beautiful tourist spots: San Juan, Isla Verde, Vieques, Rio Grande, Luquillo, Fajardo, Ponce, Rincon, Aguadilla, Dorado. Find the best Puerto Rico hotels by selecting your destination, or scroll down for the map of the hotels. San Juan, a vibrant capital of Puerto Rico has got to offer more than just a typical Caribbean vacation. 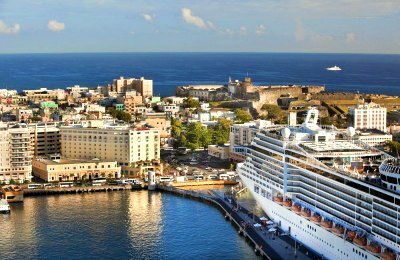 It is located on the island's Atlantic coast and is known for its dynamic nightlife, big casinos, the best attractions through the streets of Old and New San Juan, and for being a home to one of the best harbours in the Caribbean. Here are some of the best Puerto Rico hotels, located in San Juan. La Concha, a Renaissance San Juan Resort is a great choice for a luxury resort-style Puerto Rico hotel for travelers that want a lively and romantic atmosphere. Located on the stylish Condado Beach, La Concha attracts a younger crowd who want plenty of activities in a trendy atmosphere. La Concha has an exquisite award winning modern architectural style which features 232 rooms and suites which have an eclectic retro décor. The rooms are huge with a choice of ocean or pool view and there are seven categories for suites that range from junior to one-bedroom with more space and big views. All units have balconies. La Concha has a perfect location on Condado Beach which lends to a lively party scene and there are three Infinity freshwater swimming pools including an adults-only as well as one multi-tiered with waterfalls. There is a casino, spa and fitness onsite. 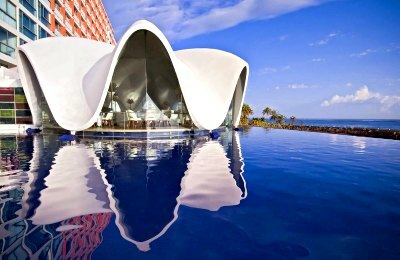 La Concha Puerto Rico hotel has seven restaurants featuring everything from a coffee shop to sushi to the incredible Perla Restaurant which is housed in a unique sea shell shaped structure overlooking the ocean. The San Juan Marriott Resort and Stellar Casino is a perfect choice for a luxury resort style Puerto Rico hotel which caters to couples, groups and families. Located on the trendy Ashford Avenue directly on Condado Beach, the San Juan Marriott Resort and Stellar Casino has an active mega resort atmosphere with plenty of amenities. The San Juan Marriott Resort and Stellar Casino has a sleek architectural style with nine categories of rooms and suites that feature a modern décor. Accommodations range from standard guest rooms to executive style one-bedroom suites and each unit has a private balcony with views of the city or ocean. 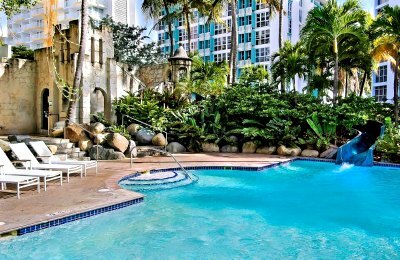 The San Juan Marriott Resort and Stellar Casino is situated directly on Condado Beach and has two freshwater swimming pools including a pool with a waterslide as well as a children’s pool. There are tennis courts, a fitness center, casino and children will enjoy a kid’s club as well as an arcade/game room. This beautiful Puerto Rico hotel has nine dining options which range from a coffee shop to innovative Latin cuisine at La Vista Latin Grill and Bar. The Doubletree by Hilton San Juan is a mid-range priced Puerto Rico hotel which is a good choice for families and business travelers. Located in the chic Condado District on Avenida de Diego, the Doubletree by Hilton San Juan offers comfort without breaking the wallet. The Doubletree by Hilton San Juan has a nice architectural style which contains 184 rooms with a contemporary décor in eight different categories. Rooms are spacious as well as offer a variety of bedding choices and most have a private balcony with views of the Condado District or gardens. The Doubletree by Hilton is a five minute walk to the white sands of Condado Beach and there is great freshwater swimming pool with waterfalls for the children as well as a fitness center onsite. There are four restaurants at the Doubletree by Hilton that range from casual dining at Café Pierre to exquisite Asian cuisine at Silk Restaurant. The Caribe Hilton is a fantastic choice for a luxury Puerto Rico hotel for couples and families who like plenty of amenities onsite. 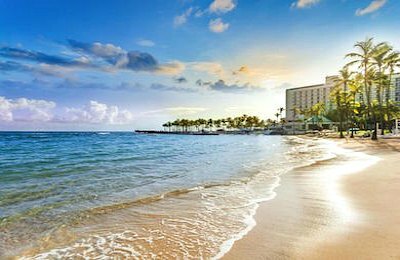 Located on a remote peninsula between Old San Juan and Condado Beach, the Caribe Hilton is a mega resort situated on 17-acres of lush tropical landscape. The Caribe Hilton is composed of two towers that feature a modern architectural style with 910 rooms, suites and villas which have a contemporary décor. There are over fifteen categories of spacious accommodations which have a balcony with views of the gardens or ocean and many suites have kitchenettes. The Caribe Hilton is directly on a private beach with good swimming in the lagoon and has four freshwater swimming pools including one which features waterfalls with a swim-up bar and there is an Infinity pool overlooking the ocean as well as kid’s pool. This Puerto Rico hotel has a fitness center, tennis courts full service spa and a kid’s club. The Caribe Hilton has eight restaurants ranging from Quiznos Sub to fine dining at Morton’s Steak House. The Condado Plaza Hilton is a mid-range priced Puerto Rico hotel which is trendy and popular with couples as well as families. Located on a remote peninsula along Condado Beach, the Condado Plaza Hilton has a nice hip atmosphere. The Condado Plaza Hilton is a modern high-rise building with over 500 rooms and suites that have a bright and funky décor. The Condado Plaza Hilton has three categories of rooms which offer varying sizes in living space and most have balconies. Three styles of suites boast more living space and bigger views from private balconies. The Condado Plaza Hilton has a small beach which is protected by a lagoon for excellent swimming and there are four freshwater swimming pools including one with a waterslide and swim-up bar, lap pool and a toddler’s pool. There are also tennis courts, a fitness center and a unique manmade coral reef attraction onsite. There are six restaurants that feature cuisine from quick bites, breakfast at Denny’s and gourmet cuisine at Pikayo’s. The Best Western Plus Condado Palm Inn and Suites is a great mid-range priced Puerto Rico hotel which is ideal for couples, families and business travelers. Located in the stylish Condado District, the Best Western Plus Condado Palm Inn and Suites is situated within an easy walk to Condado Beach. The Best Western Plus Condado Palm Inn and Suites has a modern architectural style with 151 rooms and suites which were renovated in 2012. Rooms have small French balconies and suites are similar to a one-bedroom apartment with a larger balcony as well as better views. The Best Western Plus Condado Palm Inn and Suites is one block away from the white sand Condado Beach and is close to many shops as well as dining options in the trendy Condado District. 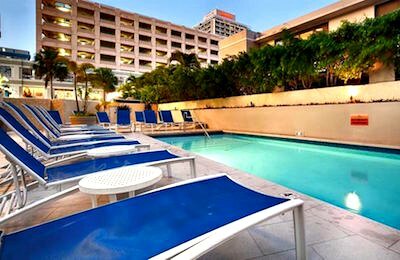 The Best Western Plus Condado Palm Inn and Suites has a nice freshwater swimming pool as well as a separate kid’s pool and there is fitness center. An added bonus is a complimentary breakfast daily and you are within walking distance to many restaurants such as Cocina Abierta which serves innovative Latin cuisine. 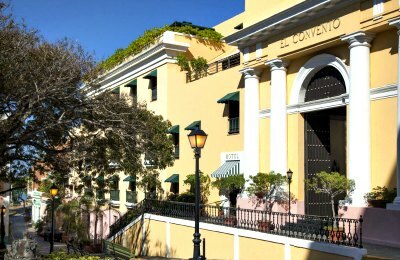 The Hotel El Convento is a superb boutique Puerto Rico hotel when you are searching for a unique and historic hotel to enjoy the sights of Old San Juan. Located on Cristo Street, the Hotel El Convento is also a perfect romantic getaway which exudes European-style and excellent service. The Hotel El Convento is a renovated convent which houses 58 rooms and suites in a wonderful Spanish Colonial building. The Hotel El Convento has ten categories of accommodations which have a charming Old World decor and Spanish antiquities with Juliet balconies that offer views of the city. Hotel El Convento is perfectly situated for sightseeing in Old San Juan and you can also enjoy the El Convento Beach Club at Isla Verde Beach. The Hotel El Convento has a small rooftop plunge pool and terrace with big views of the city as well as a fitness center. There are three restaurants at the Hotel El Convento which includes gourmet delights at Patio del Nispero as well as enjoy an added bonus of a nightly wine and cheese reception at La Veranda Terrace. 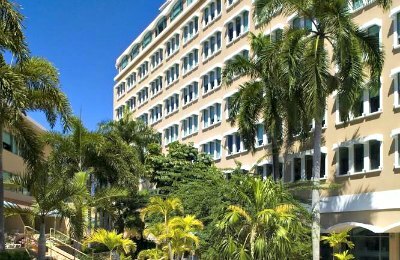 The Sheraton Old San Juan Hotel is a mid-range priced Puerto Rico hotel which offers good value to travelers and business people. Located on Brumbaugh Street in Old San Jaun, the Sheraton Old San Juan Hotel is situated in the most romantic part of Old San Juan. The Sheraton Old San Juan Hotel has a nice architectural style with 240 rooms and suites which offer spacious comfort as well as a no-nonsense décor. Some rooms have balconies with views of the city or bay and suites are superb with more living space as well as spectacular views from a private balcony. The Sheraton Old San Juan Hotel has a great location and is within walking distance to many sightseeing favorites such as Fort San Cristobal. There is a rooftop freshwater swimming pool, fitness center and spa onsite as well as excellent Puerto Rican cuisine at Palio. The Condado Vanderbilt Hotel is a perfect choice of a Puerto Rico hotel for couples who are seeking a romantic getaway as well as for business travelers who seek space and luxury. Located directly on Condado Beach, the Condado Vanderbilt Hotel has a relaxed atmosphere with plenty of amenities. 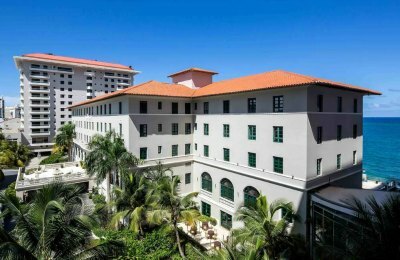 The Condado Vanderbilt Hotel has a Spanish Revival architectural style with 319 rooms and suites which have chic décor as well as plenty of 20th century antiques to compliment the stylish historic feel of the property. Rooms are beautifully decorated and some of the suites feature kitchenettes, balconies as well as butler service. 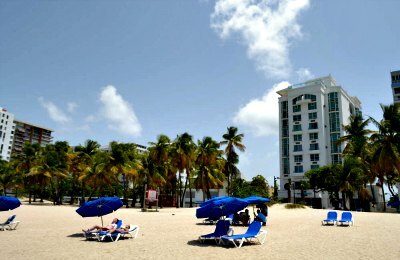 The Condado Vanderbilt Hotel is situated directly on Condado Beach with easy access to the beautiful white sands. The Condado Vanderbilt Hotel has two freshwater swimming pools which include an Infinity pool overlooking the Atlantic Ocean and there is a great wooden deck that offers big views of the ocean while you relax. There is a fabulous spa and fitness onsite as well as three restaurants ranging from gourmet cuisine at 1919 to casual dining at Tacos and Tequila. The La Terraza De San Juan is a charming historic Puerto Rico hotel which is a favorite with couples and is good for some families. 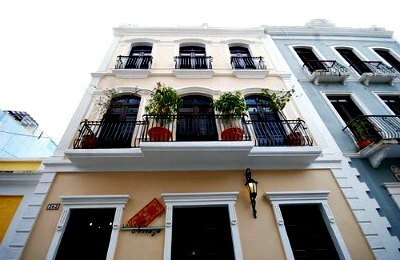 Located in the heart of Old San Juan on Calle Del Sol, La Terraza De San Juan is a small boutique hotel which is composed of two renovated 500 year old buildings. La Terraza De San Juan has a wonderful Spanish Colonial architectural style with 23 rooms and apartments in the two buildings that range from a budget-friendly windowless room to a large two-bedroom apartment which opens up to a garden. La Terraza De San Juan has a superb rooftop terrace that includes an Infinity freshwater swimming pool, a bar and great views of Old San Juan. There is another bar on the ground floor which opens to the street and you are very close to several major attractions such as La Fortaleza. There is no restaurant onsite but you will enjoy the daily complimentary breakfast. Isla Verde, a magnificent succession of beaches stretching far ahead that sits just outside Puerto Rico's capital, San Juan, is the ultimate destination for tourists and locals. Its northern border is the Atlantic ocean, and southern is downtown Carolina, a municipality of this Puerto Rican jewel. It is conveniently situated in close proximity to the San Juan International Airport and a quick 15-minute drive from the area of Old San Juan. Here are the best Puerto Rico hotels located in Isla Verde. 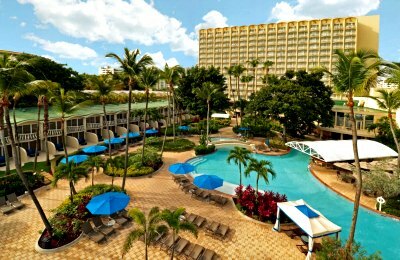 The El San Juan Resort and Casino, a Hilton Hotel is a lively Puerto Rico hotel which is perfect for couples and travelers who want to party while on vacation. Located on the northern coastline of the island directly on Isla Verde Beach, the El San Juan Resort and Casino boasts an atmosphere of a relaxed party for travelers. The El San Juan Resort and Casino is composed of three areas with over 380 rooms and suites which have a luxurious beachy décor which includes bright colors. There are a variety of choices for accommodations that range from guest rooms to larger one-bedroom suites in the Tower. All units have balconies and offer views of the gardens, pool or ocean. The El San Juan Resort and Casino is situated directly on the white sand Isla Verde Beach and offers a multitude of activities during the day. There is a gorgeous free-form freshwater swimming pool with a lively swim-up bar and an Olympic sized pool. You will enjoy nightlife onsite at the casino or live music in the lobby bar and there is a nightclub that is popular with guests. There are six restaurants featuring everything from barbeque to Italian to Asian and there is the fabulous Meat Market Miami serving grilled cuisine. 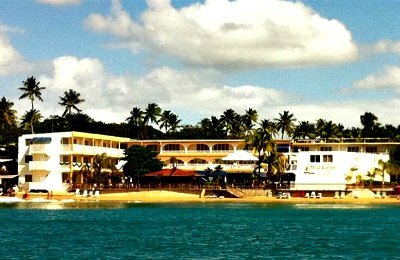 The Hotel Verdanza is a great family and value Puerto Rico hotel for people that want quick access to Isla Verde Beach. 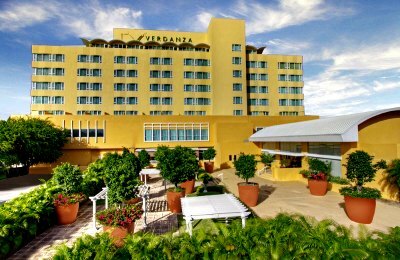 Located on the northern coastline of the island just one block from Isla Verde Beach, the Hotel Verdanza has a great atmosphere and is popular with many types of people as well as locals. The Hotel Verdanza is composed of one low-rise building next to the pool and a more modern high-rise which contain 221 rooms. Poolside accommodations include standard sized rooms with balconies overlooking the pool and the larger building contains rooms with stunning city views from floor to ceiling windows. The Hotel Verdanza is just a short walk to Isla Verde Beach and there is a great family friendly freshwater swimming pool. There are three restaurants onsite including Eighty20 for fine dining, the Burger Bar and Divino Wine and Tapas Bar. An added bonus is the rooftop terrace where you will find incredible views of the area. The Hampton Inn and Suites San Juan is a budget friendly Puerto Rico hotel which caters to business people and some families. Located on the northern coastline of the island near the airport and Isla Verde Beach, the Hampton Inn and Suites San Juan offer comfortable accommodations as well as plenty of free amenities. The Hampton Inn and Suites San Juan has a modern architectural style with 201 rooms and suites which boast a contemporary décor. Rooms have a variety of bedding choices as well as the larger suites with varying views of the pool or city but units do not include a balcony. There is a freshwater swimming pool with poolside service from Guacomayo Pool Bar and Grill. An added bonus is the complimentary hot breakfast daily and an evening reception with food as well as drinks. The Hampton Inn and Suites San Juan is a short walk to Isla Verde Beach where you can enjoy the sand as well as several restaurants such as Basilla’s Sabor Isleno. The San Juan Water and Beach Club Hotel is a perfect choice for a Puerto Rico hotel when you want something new and exciting right on the beach. Located on the northern coastline directly on Isla Verde Beach, the San Juan Water and Beach Club Hotel features an eco-Zen atmosphere as well as offering a great value for travelers. The San Juan Water and Beach Club Hotel has a sleek high-rise architectural style and is composed 80 rooms with a variety of views from city to ocean and most have a balcony or floor to ceiling windows. One-bedroom suites offer more living space and big views of the beach. Situated directly on Isla Verde Beach you can enjoy relaxing or swimming and there is a great rooftop freshwater swimming pool which has a nice bar and grill for poolside service. There is also the Zest Restaurant which features a 60-feet wide waterfall next to the bar as well as eclectic Latin cuisine. 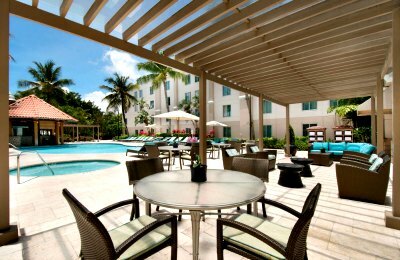 The Courtyard by Marriott Isla Verde Beach Resort is a great value Puerto Rico hotel for families, couples and business travelers. Located on the northern coastline of the island directly on Isla Verde Beach, the Courtyard by Marriott Isla Verde Beach Resort has a pleasant atmosphere for relaxing or having a good time. The Courtyard by Marriott Isla Verde Beach Resort has a sleek modern architecture with 260 rooms and suites which have been recently renovated with a fresh décor. You can choose from four styles of rooms which all have a balcony and views of the ocean or courtyard. Junior and one-bedroom suites offer more space and great beachfront views from a private balcony. The Courtyard by Marriott Isla Verde Beach Resort has a superb beach with hammocks, casino, fitness center and a 24-hour freshwater swimming pool which is complete with a swim-up bar. There are five restaurants with cuisine from around the world as well as Sirena Oceanfront Restaurant and there is live music at Picante Lobby Bar and Lounge in the evening. 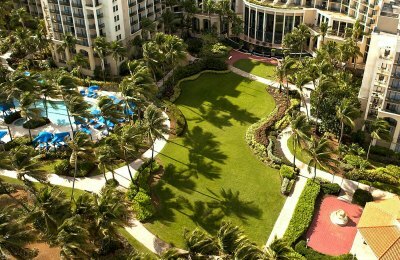 The Intercontinental San Juan is a luxury Puerto Rico hotel which attracts families, business people and couples. 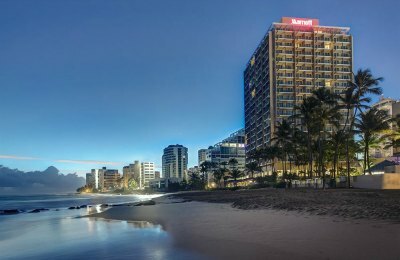 Located on the northern coastline of the island on Isla Verde Beach, the Intercontinental San Juan has a low-key atmosphere. The Intercontinental San Juan is composed of low and high-rise buildings that offer 400 rooms and suites that have a contemporary yet stylish décor. Rooms are spacious but do not include a balcony and there are several styles of suites which have Juliet balconies and nice ocean or pool views. You can upgrade to Club Level where you will find upgraded amenities including access to an exclusive club house. The Intercontinental San Juan has great beach access, a spa, fitness center and an excellent freshwater swimming pool with a rock grotto area as well as a swim-up bar. The Trattoria Italiana serves nice Italian cuisine and you can also explore the eclectic dining on Isla Verde Beach at such places as the Zest Restaurant which prepares contemporary Caribbean cuisine. The Ritz-Carlton San Juan is a luxury Puerto Rico hotel that is kid friendly and attracts many business as well as leisure travelers. Located on the northern coastline at Isla Verde Beach, the Ritz-Carlton San Juan has plenty to offer everyone including upgraded amenities. The Ritz-Carlton San Juan has a modern high-rise architecture with 416 rooms and suites which feature a contemporary décor. Rooms are spacious and there are a number of options for suites but many of the rooms do not have a balcony. You can also upgrade to Club Level where you will have access to an exclusive lounge and other amenities. The Ritz-Carlton San Juan has a great stretch of beach, plenty of organized activities, kid’s club, tennis courts, and casino as well as a beautiful freshwater swimming pool lined with palm trees. There are five restaurants featuring a variety of cuisine from seafood at Mares to grilled steaks and French cuisine at BLT Steak. The Embassy Suites by Hilton San Juan Hotel and Casino is a kids-friendly Puerto Rico hotel which boasts a pleasant atmosphere for families. Located on the northern coast of the island, the Embassy Suites by Hilton San Juan Hotel and Casino is situated just two blocks from Isla Verde Beach. The Embassy Suites by Hilton San Juan Hotel and Casino has a modern architectural style with 299 one-bedroom suites that sport a contemporary décor, kitchenette and most rooms do not have a balcony. 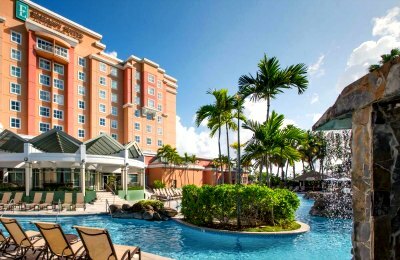 The Embassy Suites by Hilton San Juan Hotel and Casino has a superb lagoon-style freshwater swimming pool, a kid’s pool, an arcade room and a casino onsite. There are four restaurants that include an Outback Steakhouse and the Coqui Pool Bar and Grill. You will receive a complimentary breakfast and there is a nightly reception with hot appetizers as well as cold libations. Vieques, a truly amazing offshore island municipality of Puerto Rico, located on the eastern coast is something every tourist must experience when travelling to this small Puerto Rico island. Vieques' pristine beaches, surrounded by the native wild flora and leading to the island's best nature trails are not only known for their azure waters, and velvety white sands but also for a perfect seclusion that will connect you back with nature in total tranquility. There are no big resorts in Vieques, but the luxury, cozy, intimate or budget-friendly places here will delight you in every way! Here are the best Puerto Rico hotels, located on Vieques island. The Hacienda Tamarindo is one of the best choices for a romantic Puerto Rico hotel and is available for travelers over the age of 15 years old. Located on the southern coastline of Isla de Vieques within 1-mile of the village of Esperanza, the Hacienda Tamarindo is secluded with big ocean vistas. The Hacienda Tamarindo was once a former dance hall and the Spanish Colonial building is now home to 17 differently styled rooms that feature a mixture of Northeastern and Caribbean décor with many of the rooms featuring a private balcony as well as nice views of the ocean. The Hacienda Tamarindo is not located directly on the beach and you are encouraged to rent a car to visit the most pristine beaches on the island as well as experiencing the cultural aspects of Esperanza. The Hacienda Tamarindo has a nice freshwater swimming pool and includes a complimentary breakfast for guests daily. 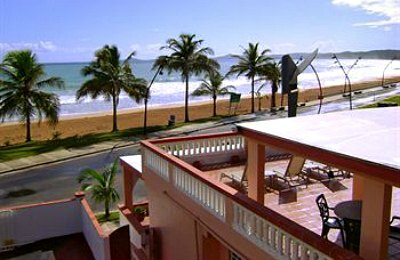 The Bravo Beach Hotel is a budget oriented boutique Puerto Rico hotel which boasts an atmosphere that is good for couples and families. 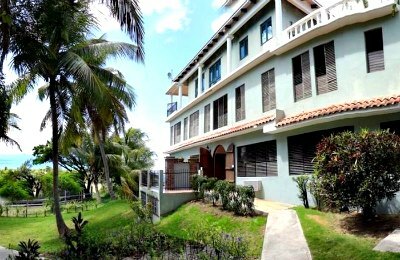 Located on the northern coastline of Isla de Vieques within walking distance of Isabell Segunda, the Bravo Beach Hotel is situated right on the beach. The Bravo Beach Hotel has a nice Spanish Colonial style with 18 rooms and suites which feature spacious living areas and private balconies many with ocean views. The suites offer more space for families and groups as well as a full kitchen. The beach area at Bravo Beach Hotel is somewhat rocky but there are several soft sand beaches within walking distance. The Bravo Beach Hotel has two freshwater swimming pools each with a lovely ocean view. You are within walking distance to Isabella Segunda which boasts art galleries, museums and numerous fine restaurants such as Bieke’s Bistro. The Bravo Beach Hotel offers a complimentary daily breakfast for guests as an added bonus. The W Retreat and Spa Vieques Island is an eclectic luxury Puerto Rico hotel that is ideal for couples looking for a romantic getaway. Located on the north coastline of Isla de Vieques along a beautiful stretch of beach, the W Retreat and Spa has a relaxing and trendy atmosphere. 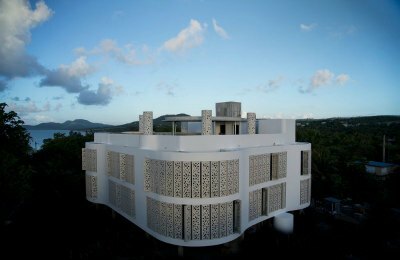 The W Retreat and Spa Vieques Island has an interesting and innovative architectural style which boasts 156 rooms and suites with an artistic boho décor. Rooms are large and there are one-bedroom suites available for even space. 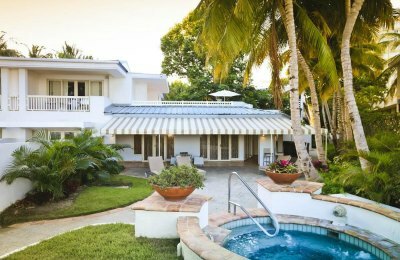 Accommodations include private balconies with views of the pool, garden or the ocean and the Whatever/Whenever service is an added bonus. The W Retreat and Spa Vieques Island has two private beaches one of which is adults-only, tennis courts, the Away Spa and freshwater Infinity swimming pool which overlooks the ocean. There are four restaurants onsite from a grill to quick bites to fine dining at Sorce Restaurant. El Blok Hotel is a uniquely designed Puerto Rico hotel which offers an eclectic atmosphere for couples and singles. Located on the southern shoreline of Isla de Vieques in the town of Esperanza, El Blok Hotel is a just moments away from the beach. El Blok Hotel has a tremendously unique architectural style which emits a soothing and relaxing atmosphere. El Blok has 22 rooms in four styles including a junior suite which have exquisite artwork and interior décor. El Blok has plenty of amenities such as easy beach access, roof-top terrace with a freshwater swimming pool and a bar onsite. El Blok has one of the best restaurants in Esperanza and feature multi-course dining for all three meals. 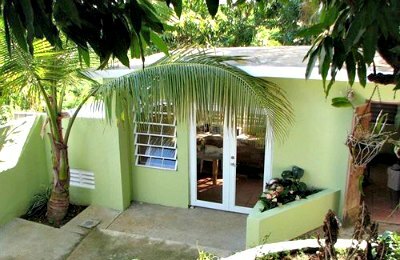 The Malecon House is a splendid boutique Puerto Rico hotel which is perfect for couples or single people who want to be directly near activities. 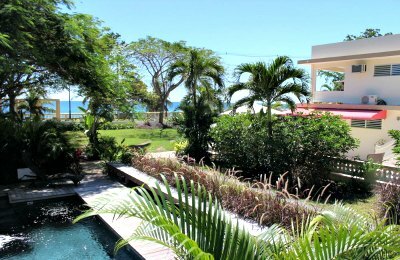 Located on the southern shoreline of Isla de Vieques in the charming village of Esperanza, the Malecon House is situated on the malecon offering easy access to many exciting attractions. The Malecon House has a wonderful Spanish architectural style with only 13 rooms which are completely different from one another in floorplan. Some offer private balconies with views of the malecon, tropical gardens and Esperanza Bay. When you stay at the Malecon House you are within an easy walking distance to many fine beaches, shops and restaurants like El Quenepo which serves contemporary cuisine. The Malecon House offers a complimentary breakfast daily for your enjoyment. 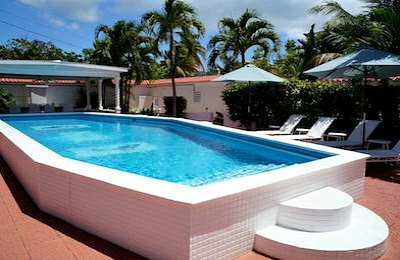 The Sea Gate Hotel on Isla de Vieques is a modest Puerto Rico hotel which is a great choice for budget minded travelers looking for comfortable accommodations. Located on the northern coastline of Isla de Vieques, the SeaGate Hotel is accessible by a 1.5-hour ferry ride from Fajardo. The SeaGate Hotel has a Spanish architectural style that features six categories of no-nonsense rooms and suites which range from basic rooms to family rooms to suites to cottages. 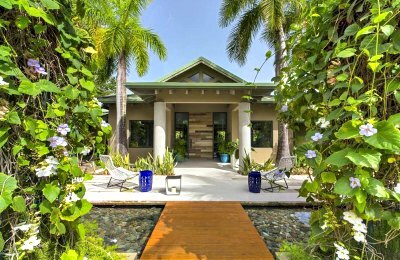 Most have a private patio with views of the tropical landscape or ocean and some are furnished with a kitchenette. 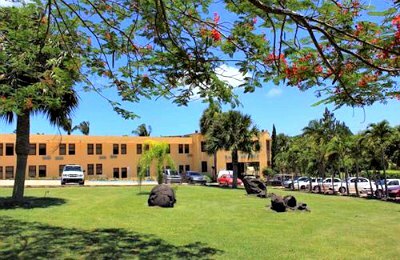 The SeaGate Hotel has a perfect location and is within walking distance to the beach, Fortin Conde de Mirasol and the Vieques Ferry Terminal. The SeaGate Hotel offers you a complimentary breakfast daily and there are plenty of restaurants within walking distance such as Coqui Fire which serves Caribbean and Mexican dishes. Rio Grande, a tropical paradise tucked away in the northern Coastal Valley, is home to one of the largest secluded areas on the entire island with access to Coco Beach. Coco Beach is surrounded with three luxury grand resorts namely Bahia Beach Resort and Golf Club, the Gran Melia Golf Resort and the Trump International Golf Club, so enjoying the nearby uncrowded and quiet beach with bright green grass and lush trees lining the ocean shores is always a great choice. Once you travel here, a number of lodging options are at your service, and budget should not be an issue as romantic resorts, best value accommodations or even vacation rentals are in abundance here. Below are the best Puerto Rico hotels, located in Rio Grande. The St. Regis Bahia Beach Resort is an exquisite secluded Puerto Rico hotel which is perfect for families and couples that are seeking luxury and added amenities. Located on the northeastern shoreline of the island near the town of Rio Grande, the St. Regis Bahia Beach Resort is situated on a 483-acre nature reserve which is adjacent to El Yunque National Forest. The St. Regis Bahia Beach Resort has a magnificent architectural style and offers large spacious rooms and suites which feature exposed beam ceilings. 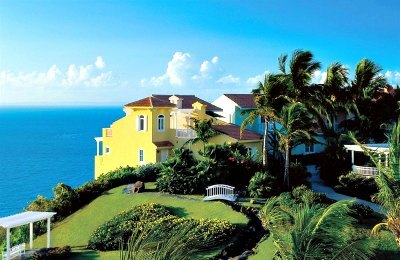 All units have gorgeous views of the ocean or rainforest from a private balcony and many boast premier butler service. 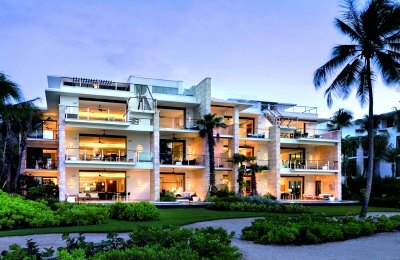 The St. Regis Bahia Beach Resort has a beautiful beach, an 18-hole championship golf course, tennis courts, a children’s program and a huge cascading freshwater swimming pool. The St. Regis Bahia Beach Resort has three restaurants onsite including the award winning Fern Restaurant which serves Latin fusion cuisine. The Wyndham Grand Rio Mar Beach Resort and Spa is a luxury Puerto Rico hotel which offers plenty of amenities for families and couples during your stay. 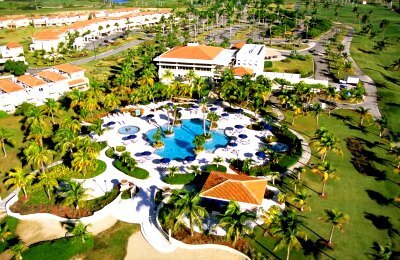 Located on the northeastern coastline of island near Rio Grande, the Wyndham Grand Rio Mar Beach Resort and Spa has a low-key atmosphere for a large resort. The Wyndham Grand Rio Mar Beach Resort and Spa has 400 rooms and suites which have a vibrant décor, are spacious and offer beautiful views of the El Yunque Rainforest and Atlantic Ocean from a private balcony. 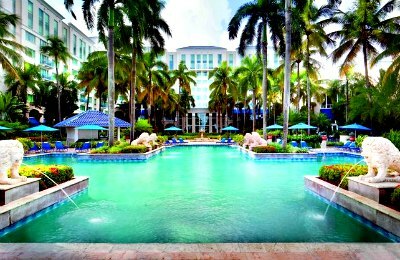 There are plenty of activities at the Wyndham Grand Rio Mar Beach Resort and Spa which include a stellar beach, two freshwater swimming pools, a children’s club, a casino and thirteen tennis courts. The Wyndham Grand Rio Mar Beach Resort and Spa has nine restaurants onsite featuring cuisine from Puerto Rico, Italy, Japan and the Americas. The Gran Melia Puerto Rico Golf Resort is an upper-end luxury Puerto Rico hotel which is great for travelers seeking multiple amenities and activities onsite. Located on a remote peninsula on the northeastern coastline of the island near Rio Grande, the Gran Melia Puerto Rico Golf Resort is situated on Coco Beach and has a nice tropical atmosphere. The Gran Melia Puerto Rico Golf Resort has a wonderful architectural style with 486 suites and villas which are available in nine categories with above average living space. Club suites provide access to butler service and several villas have private plunge pools. 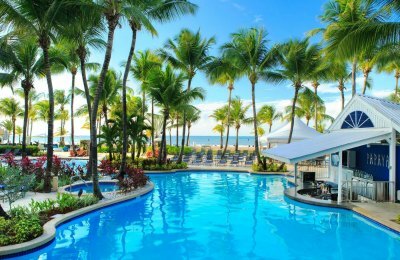 The Gran Melia Puerto Rico Golf Resort is situated on Coco Beach with easy beach access, two oceanfront fresh water swimming pools, a small casino and two 18-hole championship golf courses. You have plenty of dining options with five restaurants onsite featuring Italian, Spanish and Asian cuisine is served at Nami Asian Bistro. The three major best Puerto Rico hotels located in Luquillo provide the best amenities, the top dining facilities, the most exciting tours and activities and a world-class service you will love. Feel like at home at Luquillo Sunrise Beach Inn or Yunque Mar Beach Hotel that are both situated along the shores of their own spectacular beaches. Nature lovers will definitely savor the moments during their stay at Rainforest and Ocean View Inn at Hacienda Carabali. The nearby Carabali Rainforest Park is the ultimate outdoor destination with horseback rides, zip lines, mountain biking and El Yunque National Forest that is conveniently located a quick 20-minute car drive from Luquillo. With a total land area of approximately 28,000 acres this stunning forest will surprise you with 240 different types of trees, a variety of rare species, animals, and plants such as giant ferns, trumpet and bamboo trees and tiny wild orchids and the never ending hiking trails. The Yunque Mar Beach Hotel is a great Puerto Rico hotel choice for you when you are seeking to walk to some of the best beaches or hike in the incredible El Yunque Rainforest. Located on the northeastern corridor of the island near the town of Luquillo, the Yunque Mar Beach Hotel is situated on the beautiful Playa Fortuna and allows for easy access to some of Puerto Rico’s most stunning attractions. 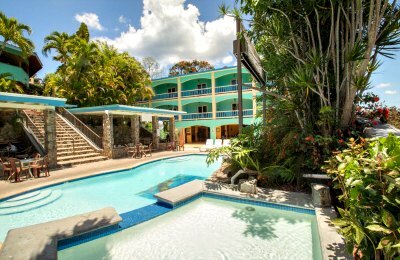 The Yunque Mar Beach Hotel has a modern style with 15 guest rooms that include two family bedrooms which can accommodate families or a group. The Yunque Mar Beach Hotel allows you to enjoy one of Puerto Rico’s best beaches and other activities like kayaking in the bioluminescent bays which glow at night or you can visit Culebra Island for snorkeling. There is a small freshwater swimming pool onsite and you will receive a complimentary breakfast daily. There are no restaurants onsite but you are within easy walking distance to several including La Parrilla which serves up excellent Spanish cuisine. 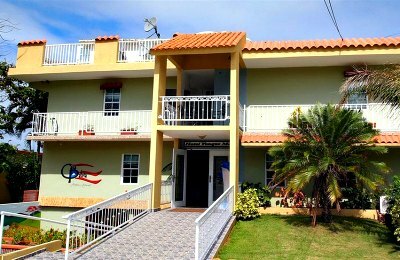 The Luquillo Sunrise Beach Inn is a quaint bed and breakfast style Puerto Rico hotel which is ideal for couples and singles. 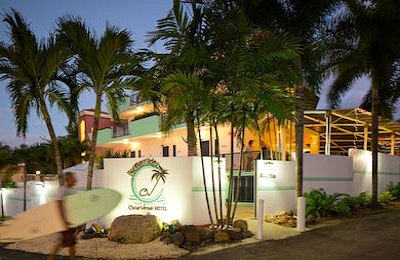 Located on the northeastern shoreline of the island 50-minutes from Old San Juan, the Luquillo Sunrise Beach Inn has a relaxing atmosphere and is close to many exciting adventures for you to have in Puerto Rico. The Luqillo Sunrise Beach Inn has a Spanish Colonial style with 17 rooms and suites that range from standard to deluxe as well as a two and three-bedroom suite for larger groups or families. Each has a private balcony with excellent views of the ocean. The Luquillo Sunrise Beach Inn is within walking distance to many fabulous beaches such as Playa Azul and the North East Corridor Nature Preserve where leatherback turtles roam the shores. You can indulge in a complimentary breakfast daily and there are numerous restaurants nearby like Pasto y Pueblo where you will find great Italian cuisine. The Rainforest and Ocean View Inn at Hacienda Carabali is an ideal Puerto Rico hotel for nature lovers and travelers who are seeking solitude in a jungle setting. Located on in the eastern portion of the island near Luquillo, the Rainforest and Ocean View Inn at Hacienda Carabali is situated on top of a hill with 600-acres of the lowlands of El Yunque Rainforest. 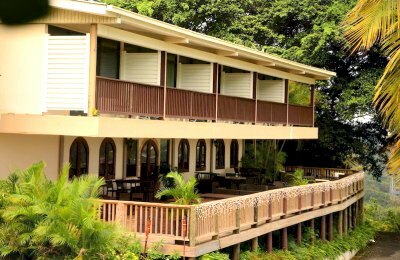 The Rainforest and Ocean View Inn at Hacienda Carabali has a nice eco-friendly style atmosphere and offers two types of loft-style suites that include views of the El Yunque Rainforest or the Ocean. The Rainforest and Ocean View Inn at Hacienda Carabali is ideal for off-property ventures within Puerto Rico with in an easy distance such as hiking, biking, snorkeling or sightseeing in Old San Juan. There is also a small freshwater swimming pool onsite with big ocean views. The Rainforest and Ocean View Inn at Hacienda Carabali has one restaurant onsite which is primarily open in the evening. Fajardo offers a generous amount of cozy but splendid accommodations. One of Puerto Rico's most luxurious resorts, El Conquistador Resort is located right here steps away from the beach and even has its own marina. Fajardo Inn Resort and Las Casitas Village are considered as the other top and most popular hotels in Fajardo. Ocean front villas, budgets hotels or ecolodging is widely available as well. Here are the best Puerto Rico hotels, located in Fajardo. Las Casitas Village, a Waldorf Astoria Resort is a good option as a Puerto Rico hotel for families and couples. Located on the northeastern shoreline of the island near Parque La Juventud, Las Casitas Village is associated with the El Conquistador Resort Golf Club. Las Casitas Village is part of a larger mega complex and offers standard rooms to three-bedroom condominiums with full kitchens. Las Casitas Villages boasts a variety of activities onsite like two freshwater swimming pools and you have full access to the amenities at El Conquistador such as Coqui Water Park, tennis courts and golf course. Las Casitas has an all-inclusive package for you to choose and there are two restaurants onsite open during the day. Dinner can be found at the El Conquistador at one of the several restaurants. 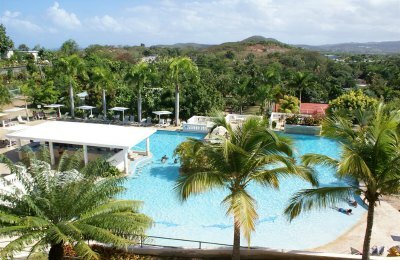 The Fajardo Inn Resort is a comfortable and affordable Puerto Rico hotel which is great for scuba divers, couples and families. Located on the northeastern shoreline of the island near the town of Fajardo, the Fajardo Inn Resort is situated in a lush tropical garden and is close to the Puerto Del Ray which is one of the largest marinas in the Caribbean. The Fajardo Inn Resort is composed of 125 rooms and suites in nine different categories from standard to double family to single suites to double suites with a balcony. Accommodations are simple and comfortable but not all rooms and suites have balconies. The views vary from a tropical landscape to ocean. The Fajardo Inn Resort is not situated on a beach but there are several within an easy driving distance such as Playa de Fajardo and Reparto La Playa. Activities are superb within the onsite Coco’s Park where you will find mini-golf, a playground, tennis courts and a nice free-form freshwater swimming pool with a swim-up bar. The Fajardo Inn Resort has two onsite restaurants that feature gourmet cuisine at Star Fish and the Blue Iguana Mexican Grill and Bar is more casual. Ponce, a well-preserved old town located on the southern coast of Puerto Rico and bordered on the south of the Caribbean sea is famous for its massive European and Puerto Rican art collections carefully stored in the Museo de Arte de Ponce, grand mansions build in the 19th-century style and the largest 1838 coffee plantation. There's one grand best Puerto Rico hotel, located in Ponce. The Hilton Ponce Golf and Casino Resort is a fantastic Puerto Rico hotel for families and active couples that want lots of amenities in a beachside setting. 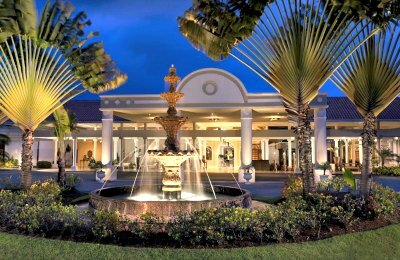 Located on the southern coastline of island near the city of Ponce, the Hilton Ponce Golf and Casino Resort has upper-mid-range accommodations that were renovated in 2012. The Hilton Ponce Golf and Casino Resort has 255 rooms and suites which range from spacious guest rooms to studios to immaculate one-bedroom suites. All units have a private balcony with views of the resort, gardens or ocean. The Hilton Ponce Golf and Casino Resort located directly on a dark sand beach which offers great swimming. There are plenty of amenities at the Hilton Ponce Golf and Casino Resort which include a fabulous freshwater swimming pool with slides and fountains, a kids club and 27-holes of championship golf. Nightlife includes nightly karaoke, a trendy lounge and a small casino. Dining options are numerous with four restaurants which include the acclaimed La Cava Restaurant which serves Caribbean-style gourmet cuisine. Rincon, located on the Western Coastal Valley is another great, fun and tourist-friendly municipality of Puerto Rico. It is home to a Punta Higuero Light, a lighthouse that was built in 1892 by the Spanish government and was later rebuilt in 1922 by the United States Coast GuardBest Puerto Rico hotels, located in Rincon, are spread out over the town's magnificent powder-sand beaches. A variety of unique locations are available such as guest houses, inns, private beachfront villas, condos with a breath-taking ocean view, or even if you are looking for a place to stay overnight, Rincon caters to all sorts of travellers, so finding your lodging will be easy. The Villa Cofresi Hotel Rincon is a nice choice for families and travelers who are looking for well-priced Puerto Rico hotel which offers a beachside setting. Located on the western coastline of the island directly on Rincon Beach, the Villa Cofresi Hotel Rincon is family owned and operated with reliable units. The Villa Cofresi Hotel Rincon has 111 rooms and suites which are situated in low-rise modern style buildings. There are five categories of accommodations which range from standard to deluxe to a deluxe with a kitchenette to a two-bedroom apartment with a full kitchen. All units have a balcony with varying views from the pool or ocean. Villa Cofresi Hotel Rincon is situated directly on Rincon Beach where the swimming is spectacular. There is a centrally located freshwater swimming pool with views of the ocean and you can indulge libations at the wonderful El Bohio beachside bar. You will receive a complimentary breakfast and the cuisine at La Ana de Confresi is excellent and this restaurant attracts diners from other hotels as well as the locals in Rincon. The Lazy Parrot Inn Hotel is one of Rincon’s most notable Puerto Rico hotel which is a great budget choice for couples and families. Located on the western coastline in the town of Rincon, the Lazy Parrot Inn Hotel is composed of two buildings that boast a Spanish Colonial style in a rural tropical setting. The Lazy Parrot Inn Hotel has only 21 rooms which range from a small economy to value with views of the garden to upper value with views of the city to poolside rooms with views of the pool. Each unit has a balcony except for the economy rooms and all rooms have a mini-kitchenette. Situated just a short drive away from spectacular beaches the Lazy Parrot Inn Hotel has a nice freshwater swimming with a super friendly atmosphere. There are two dining choices which include Mi Familias Pizza which is poolside and Francisco’s Caribbean Local Cuisine has innovative local cuisine. Casa Verde Hotel is a mid-range boutique Puerto Rico hotel which is ideal for couples who want to relax. Located on the western coastline near the town of Rincon, Casa Verde Hotel sports s sleek architectural style with a modern décor. The Casa Verde Hotel has 16 rooms and suites which range from a standard room to a junior suite to a one or two-bedroom suite. All units have a balcony with views of the gardens or ocean. The Casa Verde Hotel is situated a short walk from the beach where you can lounge or swim and there is one freshwater swimming pool for you to enjoy. You will receive a complimentary breakfast each day and the Saltaire Restaurant specializes in upscale cuisine. You will also enjoy the enchantment of Kahuna Bar and Grill which is fashioned after a treehouse with big views of the ocean. Aguadilla, another small but busy municipality of Puerto Rico is located on the northwestern tip of the island and is bordered by the Atlantic ocean to the north. Aguadilla is not only famous for being a processing and trading center for cotton, tobacco, fruits, coffee and sugar but also for its unspoiled, gorgeous, endless white powder-sand beaches. Those whose passion is surfing will love the Crash Boat Beach, the Gas Chambers Beach and the Wilderness Beach for their crystal-clear waters, warm crushing waves and glowing sand! Here are the best Puerto Rico hotels, located in Aguadilla. The Courtyard by Marriott Aguadilla is a great choice for business and families when you are booking a Puerto Rico hotel. 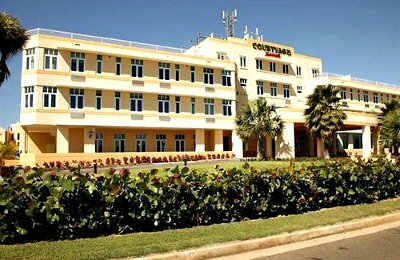 Located on the western coastline of the island in the town of Aguadilla, the Courtyard by Marriott Aguadilla is actually a converted military hospital which boasts a sleek art deco style. The Courtyard by Marriott Aguadilla has four categories of rooms ranging from a spacious guest room to superior to a junior suite to a two-bedroom family suite. The Courtyard by Marriott Aguadilla is a short drive to Crashboat Beach which boasts great surfing and there is a freshwater swimming pool onsite as well as a kiddie’s pool with slides. 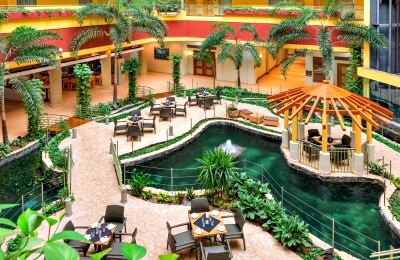 The Courtyard by Marriott Aguadilla offers a casino, fitness center and spa onsite for enjoyment. You can indulge in all three meals at the onsite RB Restaurant. The Parador El Faro is a mid-range priced Puerto Rico hotel which is ideal for people looking for comfortable accommodations without the hassles of a big hotel. Located on the western coastline of the island near the town of Aguadilla, the Parador El Faro is situated on 17-acres of lush tropical landscape. The Parador El Faro is composed of low-rise buildings which blend into the natural surroundings without being pretentious and the 69 units range from a spacious room to a house villa that sleeps six people. The Parador El Faro is 2-miles from Crashboat Beach and offers a nice freshwater swimming pool onsite. There is one restaurant onsite that offers all three meals and with a great location In Aguadilla you have dining options within a short distance like Mona which serves great international cuisine. Dorado a town and municipality of the northern coast of Puerto Rico is just 17 km (11 miles) of a drive from San Juan. Dorado is a perfect tourist destination regarded for its hotels, glorious beaches and a number of golf courses with outstanding practice facilities. Dorado Beach Resort and Club, Embassy Suites by Hilton Dorado del Mar Beach Resort and Hayatt Hacienda del Mar Golf Course are some of the most luxurious best Puerto Rico hotels, located in Dorado, just along the shores of the ocean. They offer a vast array of world class experiences, the best amenities, and top notch service you will not be able to resist. Choose from a variety of other lodging opportunities, such as oceanfront villas and condos or apartments and gueshouses for rent and make this extraordinary paradise of Dorado a new place to stay for you and your family! The Dorado Beach Resort and Golf Club is a luxury Puerto Rico hotel surrounded by a lush tropical landscape with all the amenities for couples families, groups and singles. Located 40-minutes from San Juan along the northern coastline, the Dorado Beach Resort and Golf Club are situated on a two mile stretch of beach adjacent to the Parque Nacional Cerro Gordo. 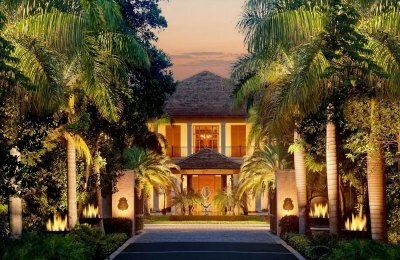 Accommodations range from Ritz-Carlton Reserve with ultra-luxurious rooms and suites to the Plantation Resort Residences which boast three-bedroom condominium. The Dorado Beach Resort and Golf Club has an array of amenities that include the Watermill Aquatic Adventure Park, plenty of beachside fun, a gorgeous swimming pool overlooking the ocean as well as three championship 18-hole golf courses with one being the #1 rated golf course in Puerto Rico. This Puerto Rico hotel offers an array of dining from seven different restaurants which include beachside dining at Encanto Beach Grill as well as fine dining at Zafra. The Embassy Suites by Hilton Dorado del Mar Beach Puerto Rico hotel has a nice atmosphere for families and offers enough amenities to keep people busy. Located 30-minutes from San Juan on the northern coastline of the island near Dorado, the Embassy Suites by Hilton Dorado del Beach Resort has direct beach access. Accommodations are one-bedroom suites with a small kitchenette and many units have a view of the ocean. In addition, there is a nice swimming pool with deck for you to lounge and relax. You can indulge every morning in a complimentary breakfast and in the evening there is a reception with appetizers as well as cold beverages.